Have you ever wondered what it's like to have a robotic vacuum? I always did. I had always wondered if it was pure magic or something too good to be true. I'm sure you're sitting there wondering the same exact thing! I knew I had to try one for myself self and see if it was worth it. I had always dreamed of getting one, pressing the button and walking away while it picked up all the little crumbs that my children left all around the house everyday. Not to mention pet hair too. After all that's what it seemed like you did with the thing. Could it make my life a little easier? 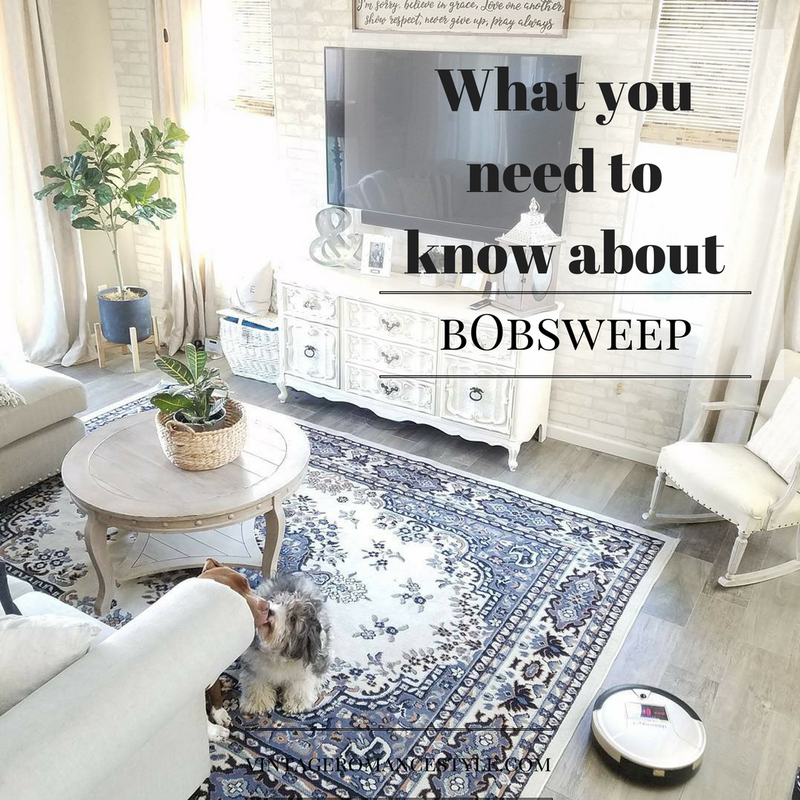 Read my thoughts on bObsweep below! I waited a few months to write this blog post so that I had time to fully understand my bObsweep and see how it worked. Let me start by saying that I had no idea how powerful this little guy could be! I have always used my shark vacuum cleaner and thought it did the job but after I charged my bObsweep and used him for the first time I was shocked at how much he picked up! Dirt and pet hair I didn't even know was there! Seriously, filled the entire container in the 1st full sweep. Gross right? It will pick up a lot of dirt even after I have used my traditional vacuum. The best thing about it is that it has a UV light that kills germs so I know my faux wood tile floors, carpets and rugs are really getting a cleaning! 1. He doesn't go in lines. On his first sweep he will randomly go around figuring out your room and finding his pattern. Don't worry if he goes by some dirt. He will come back to get it. 2. The charge is good for about an hour of continuous cleaning. Now if you have a very large room, he will continue to work until his battery gets low and then will head back to the charger. That means sometimes, with his random patterns, he may not get every square inch. If you use him everyday there really wont be much to pick up though! 3. You can schedule his cleaning times! Although it says you can clean while you sleep, depending on your furniture and cabinets this may not be a good idea for you. For my home, bObsweep gets wedged in 2 particular places. Under my media stand and under my dishwasher. He will keep cleaning in that one stuck place and I will have to grab him and move him so that he can keep going. Not a problem though. I just run him while I'm cooking dinner so I can listen for him! 4. Empty his container and clean his bristles often! With all the tiny things, dirt and hairs he picks up make sure to check the brush and empty his container after every full use. It will get fuller faster than you think. This guy is a deep cleaning machine! 5. Sometimes he may need help finding his dock is he has gone too far. I just pick him up and put him closer. Not a big deal. 6. The kids can use the remote to steer him to clean up their messes! Or if he has missed a spot you can steer him to clean it right up. 7. He will become part of the family. I didn't realize how much of a HUGE help he is and how much I truly need him until I got him. It simplified my life a little more and made me feel like my house was a lot cleaner with the uv light and deep cleaning ability. All of my 2 dogs shedding hair is kept off the floor and no longer sticking to my socks!. 8. He will clean under the beds! Huge YAY on that. He also will go under the dressers. Now my home feels even more clean. 9. He won't fall down the stairs. He has a sensor so that when he is cleaning at the top of the stairs he won't fall over. 10. He cleans the corners! 11. You're friends will want one too! I received this product for a review and fell in love! All opinions are mine and mine alone.